Powell's subscription club delivers the best new books, with special attention to independent publishers. Signed editions. Inventive, original sets. Exclusive printings... Every six to eight weeks, another installment to read and admire. Plus, every package is stocked with exciting surprises! Only $44.95 per shipment, includes shipping and handling within the United States. 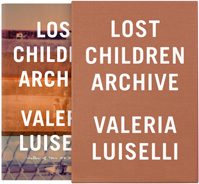 In Lost Children Archive, Valeria Luiselli documents an unnamed family's journey from New York to Arizona, to reach Apacheria, the region formerly inhabited by the Apache people. Their winding story is told through introspective, journal-like entries that not only detail the characters’ progress towards Apacheria, and their many stops along the way, but also highlight the complex relationships within the family unit. An unfolding news story about refugee children provides another layer of stress and urgency to their travels. Lost Children Archive features a chorus of extremely rich and satisfying voices, while Luiselli’s timely message and original, heartfelt storytelling invite readers to step into the car and join the family’s journey. We are extremely proud to present Lost Children Archive as Indiespensable Volume 79. Check out BOOX, Powell’s subscription picture book club for kids.